An exquisite photo of Earth's horizon taken from the International Space Station reveals the glimmer of daybreak on one side, offset by dazzling auroras over the planet's South Pole region on the other. The remarkable photo from space was captured by one of the astronauts living aboard the International Space Station on March 6, as the orbiting outpost flew over the Indian Ocean, roughly 1,200 miles (1,930 kilometers) south of Australia. Auroras over the South Pole are called the southern lights, or aurora australis. When these dazzling light shows occur over the Arctic Circle, they are known as the northern lights, or aurora borealis. Two different Russian space vehicles can also be seen in the foreground of the image. 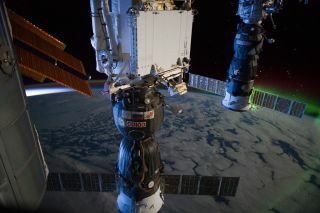 The Soyuz space capsule, which carries spaceflyers to and from the station, is in the center of the image, and is connected to the Pirs docking compartment on the Russian segment of the complex. The robotic Russian Progress cargo ship is located on the right side of the image. The International Space Station flies about 240 miles (386 kilometers) above the Earth's surface, and is currently home to six spaceflyers. The station's Expedition 30 is made up of American astronauts Dan Burbank (commander of the mission) and Don Pettit, Dutch astronaut Andre Kuipers, and Russian cosmonauts Anton Shkaplerov, Anatoly Ivanishin and Oleg Kononenko. The astronauts aboard the space station often share photos of Earth from space for science and public outreach purposes. NASA recently released spectacular photos and videos of Earth's auroras taken by Burbank and Pettit. These images were part of a coordinated campaign, called AuroraMAX, aimed at engaging the public in the beauty of the northern lights and the science behind the natural phenomena. AuroraMAX is a collaboration between NASA, the University of Calgary, the city of Yellowknife in Canada, Astronomy North and the Canadian Space Agency.